There has been a great deal of discussion the last few weeks over the concept of “defunding” ObamaCare. As I understand the debate, the proponents of “defunding” believe and argue that ObamaCare will simply disappear if the Congress and the President fail to approve a “Continuing Resolution” (“CR”) that is needed to fund the federal government for the next year. Step one of the “defunding” process was accomplished when the House passed a Continuing Resolution on September 20, 2013 that did not include funds for ObamaCare. Despite the valiant efforts of Sen Cruz and a handful of other GOP Senators, the Senate will likely pass a Continuing Resolution later this week that will include funding for ObamaCare. I wasn’t satisfied with not knowing the “end game” and what it means for America, and I suspect the readers of this publication aren’t satisfied either. So bear with me as we explore what a “shutdown” of the federal government means, in the context of the failure of our political leadership to reach agreement on a new CR by October 1, 2013. The basic thoughts that will be expressed in this article are based upon a memorandum prepared for Senator Tom Coburn in July, 2013 by the Congressional Research Service that explains what this concept actually means in real life. As you might expect, a “shutdown” in the language of Washington D.C. does not mean what it would mean to most of us who live beyond the Beltway. In fact, the “shutdown” scenario means that a only a limited number of federal government programs actually stop operating. There are so many exceptions to any “shutdown” that it is highly unlikely that most of us would even notice that a “shutdown” had happened, because it wouldn’t affect our lives – at all. Article I, Section 9 of the Constitution states that “No Money shall be drawn from the Treasury, but in Consequence of Appropriations made by Law.” On its face, this provision would lead a reader to think that this discussion should be a short one. However, it has always been recognized that a literal interpretation of this provision would make it impossible for the federal government to function at all. A literal interpretation would render void any and all contracts entered into by the federal government that extended for over one year. The Antideficiency Act (the “Act”) fills this logical gap by stating that federal officials are prohibited from entering obligating funds, before they are appropriated, except as otherwise provided by law. 31 U.S.C. 1341. Similarly, the Act prohibits employment of persons exceeding what is authorized by law. 31 U.S. C. 1342. In short, and as you may have guessed, in an extraordinary range of matters, there are laws authorizing the obligation of funds and the employment of people before the money is appropriated. (iv) Activities incidental to the performance of other presidential or congressional duties. Attempting to rein in the out-of-control spending of the federal government has been a persistent problem throughout the history of the Republic. However, we need only look to some of the recent “shutdown” fights to get a good sampling of which functions have been deemed to be essential. Perhaps the closest analogy is what happened with the Social Security Administration (the “SSA”) during the relatively brief “shutdowns” in Fiscal Year 1996. During those “shutdowns” the SSA continued to process and pay benefit claims under the Social Security and other programs. The rationale was a combination of the “multiple year” and “no year” appropriations for the entitlement benefits, together with the “necessary and incidental” services rationale to keep the employees on the payroll without furloughs. We should expect that a similar approach will be taken by the Obama Administration towards running the federal government, and the ObamaCare program specifically, in the event that there is no CR adopted by October 1, 2013. In fact, since there was no challenge to this Executive Branch approach in the 1995-1996 time frame, it would be treated as strong precedent by any Federal Court that is asked to review the actions of the Obama Administration in implementing a “shutdown” scenario. In addition, the courts have been loath to become embroiled in this type of Executive Branch discretionary action and may very well punt any lawsuit by relying on the “political question” doctrine. How Would a “Shutdown” Affect ObamaCare? 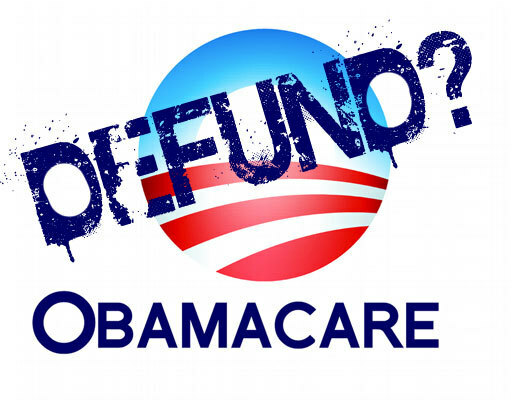 The immediate issue that is presented by the current debate over the “defunding” of ObamaCare is what would happen to those laws in the event that the White House and Congress agree to “defund” the programs through adopting a CR that doesn’t contain current funding for implementing ObamaCare – but FAIL to repeal the provisions of the various laws that make up ObamaCare. Even though we know this scenario doesn’t have a “snowball’s chance” of happening, assuming this happens allows us to proceed quickly to the meat of the discussion. First, the provisions of ObamaCare having nothing to do with current appropriations; they will continue unaffected. For example, the planned reductions in the Medicare Advantage program will proceed, as will the planned phase-out of the hospital Disproportionate Share Program. Individuals will still be mandated to have insurance coverage or pay a penalty “tax,” and the numerous other unwise changes in America’s health care system will not be fixed. In addition, other new taxes set forth in ObamaCare are likely to be assessed and collected. Second, the overall implementation of ObamaCare will proceed largely unaffected because: (i) the government can rely on “multiple year” and “no year” appropriations for funding; and, (ii) many of the activities surrounding the implementation of ObamaCare can be shoehorned into the exceptions to the Antideficiency Act described above. For example, billions of dollars of mandatory funding was contained in specific appropriations in the ObamaCare legislation and that funding is not subject to the appropriation process. Simply stated, a failure to reach an agreed CR this year for the annual funding of the federal government might delay, or slightly impede the implementation of ObamaCare, but the absence of a new CR would not have the effect of eradicating the program and all of its problems before it can damage our economy generally and, more specifically, the American health care system. ObamaCare poses an enormous threat to our economy, and more specifically, to our nation’s health care system. However, this threat cannot be countered with an easy solution, such as “defunding” ObamaCare. That is perhaps an excellent political position to take, and a strong political slogan – but it is not the solution to the problem of ObamaCare. ObamaCare is a political problem and it requires a political solution. That means that opponents of this poorly conceived and poorly executed attack on the American health care system will need to capture control of both the White House, and, likely, both chambers of the Congress to eradicate this program. It will take hard work and a sustained effort – but with the grace of God we can attain this result. Read more articles by featured contributor William Todd on OCR.